Let me continue to take you back in time to fall pictures. One layout from 2007 and one from 2008. 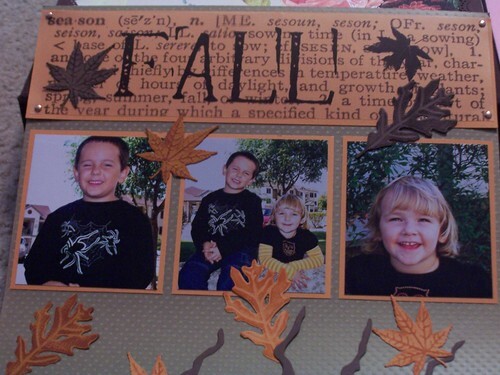 A word of caution about my all over the place scrapbooking. I often end up moving pages within my scrapbook (sometimes like 1/2 the album!) and I also end up with holes to fill when accommodating double and single page layouts. If I scrapped in order then I'd know how many pages to make each layout and I'd always know how many sleeves I need. But I don't operate that way. I will tell you if you scrap all over the place (like me) it's worth switching to the D ring binders like American Crafts makes. They are sooooooooo much easier to swap layouts around and add a page here or there. Now on to my 2 layouts to share with you. This layout was fun to make. I only used card stock and die cuts. 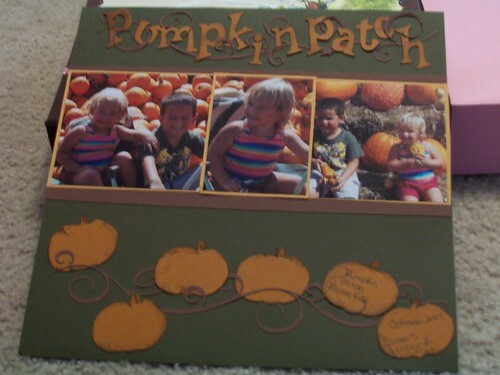 I put the journaling on two of the pumpkins in the vine. I had that Fall transparency for literally years. I finally cut it up so I could (would) use it. I have trouble parting with supplies sometimes. I think is this layout or this person worthy of the supply. It's silly I know. Like I'm not worthy of a layout with the good stuff on it.